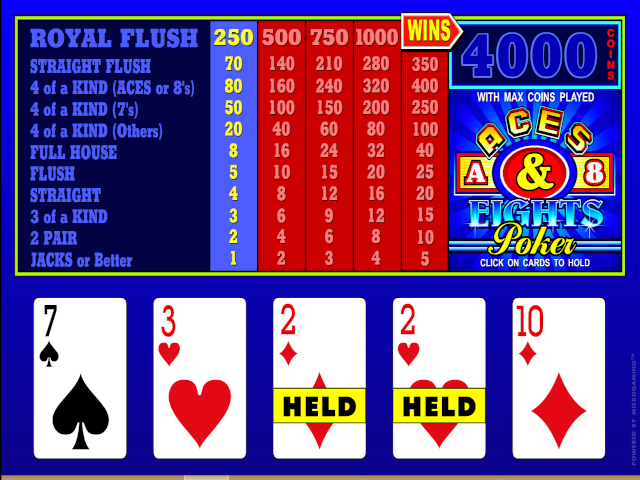 Royal Flush: 250, 500, 750, 1000 or 4000 with max coins played. Straight Flush: 70, 140, 210, 280, 350. 4 of a kind (Aces or 8’s): 80, 160, 240, 320, 400. 4 of a kind (7’s): 50, 100, 150, 200, 250. 4 of a kind (others): 20, 40, 60, 80, 100. Full House: 8, 16, 24, 32, 40. Flush: 5, 10, 15, 20, 25. Straight: 4, 8, 12, 16, 20. 3 of a kind: 3, 6, 9, 12, 15. 2 pair: 2, 4, 6, 8, 10. Download and play Aces and Eights today.